Award-winning pianist and composer Sean Foran is a musician with a clear sense of an individual aesthetic. With a growing profile in Australia and internationally, his music is melodic, engaging, and manages to draw stylistic influences together in a vibrant manner. 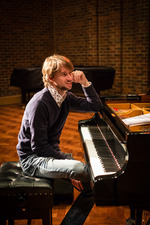 Sean graduated from the Queensland Conservatorium with a major in Jazz Piano. He also holds a graduate certificate in Arts Administration from Queensland University of Technology, and a Master's of Arts in Jazz Performance (with distinction) from the Leeds College of Music in the UK. In 2009 he won the APRA Professional Development Award in the Jazz category. He is also a multiple winner of Queensland's QSong Jazz Award in 2010, 2008 & 2006. He has been the recipient of the prestigious Brisbane City Council's Lord Mayor's Artist Fellowship in 2007, which together with funding from the Ian Potter Cultural Trust enabled him to complete his MA with distinction, studying with artists such as John Taylor, Lars Jansson, Tord Gustavsen and Matthew Bourne around Britain and Europe. Best-known for his work with the contemporary music trio TRICHOTOMY (previously Misinterprotato), he has released five acclaimed albums with this group on the Jazzhead label (Australia) and Naim Jazz (UK). In 2011 the album The Gentle War was nominated for the Bell Award for Australian contemporary jazz album of the year, and the album Fact Finding Mission was nominated for both the AIR and BELL Awards for contemporary album of the year in 2013. Additionally in 2013, TRICHOTOMY was a finalist in the Excellence in Jazz category in the Art Music Awards presented by APRA and the AMC. In 2010 he was the musical director/composer of While Others Sleep, a collaboration between Misinterprotato and Expressions Dance Company featuring his work. Foran also wrote and arranged works for the album HEALTHY - a collaborative project of jazz & classical music with the contemporary chamber ensemble Topology. His composition That which is not fleeting from this album was a finalist in the 2011 Art Music Awards (Jazz Work of the Year category). Sean Foran arranged and co-wrote compositions on Nightlight, a Sean Foran/Megan Washington release. Nightlight won the Bell Award for Vocal Album of the Year in 2009. Additionally he has collaborated with and had works performed by: the Queensland Symphony Orchestra, Collusion, Southern Cross Soloists, Lunaire Collective, Julian Arguelles, Froy Aagre, Peter Knight, and more. He maintains a busy schedule in Brisbane in his roles as co-creator & co-director of the publishing company Prepared Sounds, lecturer at Jazz Music Institute (JMI) Brisbane and Head of Contemporary Music at JMC Academy Brisbane. A keen educator, he has conducted workshops in performance, composition and music business around Australia, the UK, Japan, China and Indonesia.